Emerson Unidrive M100 AC Drive - Compact Open Loop AC Drive | PICS, Inc. This compact open loop ac drive delivers an economical open loop drive for general manufacturing applications. 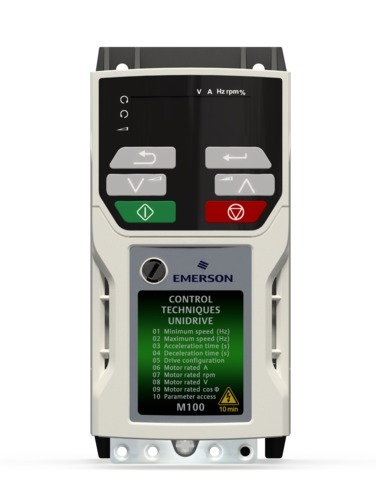 The M100 has a tough design for manufacturing environments. Tested through many environmental and certification processes, the M100 holds up. The M100 AC Drive is commonly used for frequency control for fans, pumps, conveyers, and mixers. PICS also carries the M101 variant, which has a speed potentiometer keypad to enhance customer customization and easy usage.